Willapa Bay Beach House - In the Heart of Tokeland Village. If you want spend some time next to the mighty Pacific Ocean, but you don't want swarms of tourists getting in your way, then this is the spot! Just a quick half hour drive down the coast from Westport, you'll find the peace and serenity you've been waiting for. Empire spit is where the Pacific spills into Willapa Bay and the small town of Tokeland sits right there perched out from the highway. When you step inside the house you'll see why this is such a gem. with newer appliances and furniture, this updated home will feel comfortable and relaxing. With our wooden stove available for use, you're sure to feel right at home. 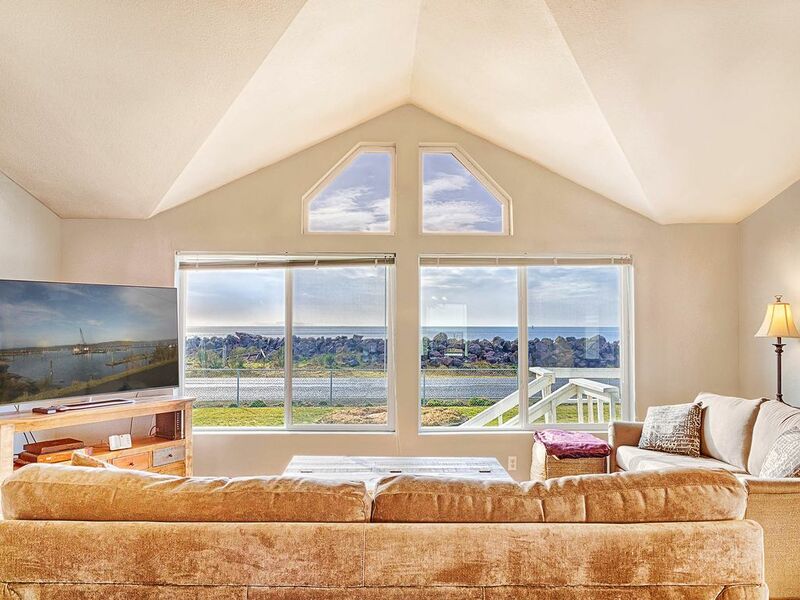 The living room has oversized windows which look out over the ocean, giving you the best unobstructed views of those waves you dream of all year. The huge flat screen TV will help keep you occupied in the evenings and a short walk down to the fishing boats is a great way to start the day. The serenity and low key atmosphere here will be a huge help getting you to refresh and relax. Willapa Bay holds 3 total bedrooms and 2 full bathrooms, making it perfect for any family or group of friends looking to escape. Bring up to a total of ten people - only if they're deserving of the views of course! The master bathroom holds an oversized tub, perfect for soaking up in after a long day beneath the sun. Our kitchen is spacious enough for the cook in the family to whip up a great meal. Enjoy it at the dining room table that has enough room for everyone. We provide fresh towels and linens as well as all of the pots, pans and kitchen & table ware you'll need to make your stay feel like a home away from home. Looking to book one of our properties here in Tokeland? Well you've come to the right place! We know the ins and outs of everything to do here on the edge of Washington. This is the true definition of a small town. The total land area is half a square mile. There isn't much for stores or shops, but what makes up for that is the sweeping, unobstructed views of the ocean. A short drive away, in Westport the warm weather brings many fishing options such as charters and tours. Go on a boat tour to see the water and beaches surrounding. Enjoy surfing or kiting at any of the beaches. Westport has a couple of wineries that are the perfect getaway for a couple looking to escape. During the colder months, you'll also have to drive a few miles but you'll find museums and restaurants that stay open year round for you to enjoy. Explore the antique shops and boutiques that have trinkets and souvenirs for your keepsakes. Here at Beachy Day Vacation Rentals, we vow to make booking with us simple and exciting. We know that booking a rental property home for your vacation can be unfamiliar territory for some, while others know their way around it. Because we know this, we ensure that each of our properties are up to high quality standards. We are available to assist you every day of the year if you have any questions or concerns before, during or after your visit to our home. We have onsite property management that are available 24/7 for anything concerning that may arise. Wow, just WOW!! The Willapa Bay Beach House is perfect. The house is spacious with an open floor plan. The kitchen is packed with any utensil you could think of and of good quality. The bedrooms (3) are spacious and the beds are super comfy. All the appliances are up to date with the fridge having an icemaker. The windows (entire front of house) overlook Willapa bay. This view is amazing as you watch the boats and wildlife. This house tops any home at SeaBrook. Every detail is thought out. There is a clam/crab/fish cleaning station next to the garage. There is a ping pong table/rec room, an outdoor fire pit. A nice propane BBQ (with propane), picnic table and basketball hoop (with BB balls). We brought our boat (for crabbing) and there is room to park, although we usually leave it at the marina. This beach house is awesome. Tokeland is our go to place when we don't want to travel too far. We love to crab, razor clam dig, and fish. As a family we thoroughly enjoyed this house. Everything as described, but you could add a few more details to your description, making it more appealing to those that like to recreate like we do. 1. There is an awesome covered clam/fish/crab cleaning station located conveniently right outside the garage. 2. The house layout is better than most of the Seabrook homes, with wonderful views of the bay to watch wildlife and boaters. 3. The kitchen is almost over equipped. There wasn't one item missing and several extra's I have never seen in rental homes. 4. Huge open area living space with tasteful decorations and furnishings that were comfortable. We brought our boat and put it the marina with the plan of keeping it there during our stay. BUT the storm changed our plans, so we brought the boat back to the house and buttoned everything up as 50-80 mph winds were expected. The wind came, we lost power at midnight. I was worried because we couldn't clean things as planned. I called your folks the next morning and they were understanding, as power outages happen a lot in January on the coast. Our power came back on at 10am, we got the clam cleaning station cleaned up and the only thing left was dishwasher, but I didn't want to leave that running. I apologize for that. We plan to reserve this house in the future, as it truly is a very nice place. The owners should be proud of their investment, and of your company for the fantastic job you do. We had a great stay at Penny's home. Location is lovely, right across the street from the water. Deck out front was great for enjoying the view. Decor is very cute and beachy, well furnished and comfy. Lots of space, good kitchen, dining room, and 2 sitting areas. Was very clean and cozy. Would definitely stay here again and recommend it. A lovely,quiet, get away with all amenities. House is very accurately described! Enjoy! This is a great home where you will wake up to the views of the ocean. We had some really good weather and the sights and sounds of the ocean was so peaceful. We very much enjoyed our stay despite that small hiccup and had a great 4th of July weekend. This home will exceed your expectations and you will love it as a getaway.